If you're worried by rising fuel bills and you're also anxious to cut your business' carbon emissions, finding ways in which you can save energy should be a natural priority. By working together with other local businesses, you can set a good example to local people, protecting the environment and boosting your reputation at the same time. Plus, as you invest in energy saving technology, you help to lower the price for the domestic customer. Everybody wins! One of the simplest things a business can do to save energy is to cut down on unnecessary lighting. Many businesses use artificial lighting all the time, even on bright sunny days when it's easy to see without it. Fluorescent lighting is a particular problem as it's psychologically bad for your staff and it can make your premises unsafe for some people with epilepsy and schizophrenia. 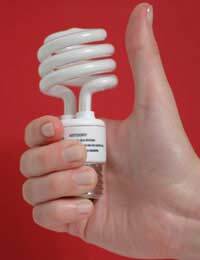 Energy saving bulbs are, by contrast, quite safe to use, plus they last for a long time and they're relatively cheap. If you use them in a shop, why not stock them, making it easy for your customers to save energy too? Many businesses keep lights on at night for security reasons although there is little hard evidence to suggest that this prevents break-ins (it is, after all, easy enough for a burglar to turn them off). Simply turning the lights off when you're closed can save you over a hundred pounds a year and encourage local people to think more carefully about leaving domestic lights on in empty rooms. How Warm is your Workplace? In Britain, the average workplace temperature is 23ºC. This has risen by three degrees over the past two decades. As people get used to the extra warmth, they start to demand it, putting an extra strain on energy resources. Cutting your workplace temperature back down to 20ºC can not only save energy, it can actually make your staff healthier and thus make your business more efficient. Why is this? Simply put, germs that infect human bodies like the warmth. They breed faster in those conditions. Air conditioning systems used for cooling in summer, which also increase your energy use, also breed germs by recycling infected air and spreading it around the workplace. By contrast, opening a window is free, uses no energy, and creates a healthier environment. Lowering the temperature on your business premises sets a good example for local people working and visiting you there. It contributes to changing what they think of as normal and thus what they're likely to do at home. Sadly, whilst some businesses are striving to reduce their carbon emissions, others are using large amounts of energy without gaining anything at all from it because their equipment is faulty. Fixing this is not necessarily expensive - a lot of problems are caused simply by a build up of dirt, leaks which can be sealed using electrical tape, or poorly calibrated thermostats. Make it a priority to check your heating, cooling and lighting equipment at least once every couple of months, and don't be miserly about buying replacement parts - doing so will generally save you money in the long term. It will also make your premises safer. Investing money in improvements to your premises, such as wall insulation and double glazing, can do a lot to help save energy and thus reduce your carbon emissions. It also helps to demonstrate your commitment to helping the environment, and as such it can increase your leverage when you get together with other local businesses to campaign for energy-saving improvements in your local area. From structural improvements in public buildings to energy-saving street lighting, these improvements can make a big difference, and you can help to make them happen - you may even choose to sponsor them. As a business owner, you have the power to initiate positive change and reduce everybody's energy expenditure.